This stunning custom imprinted pen features exciting translucent barrel colors. This Colored Barrel Click Action Promotional Pen is stylish and uniquely designed. A refreshing change from the usual old giveaway pens. Features colored barrel with chrome accents. This Metallic Colored Plastic Promotional Pen looks classy and stylish. With metal clip and chrome accents to satisfy your clients taste. Add your logo to these plastic Mardi Gras Magic Promotional Pens and like magic, they'll disappear during your giveaways or event! A custom pen with your choice of six colorful trim. An executive style promotional pen with vibrant metallic colors and brilliant chrome accents. A sleek design promotional pen with vibrant colors, tapered grip and chrome accents. 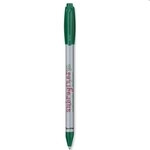 Top selling promotional pen with comfort rubber grip to match barrel color. Available in nine color options. This stylish custom logo pen is easy on your hand and your budget.